Mopp makes it simple to book a brilliant cleaner online. Just enter your postcode, choose your date and time and we connect you with one of our experienced, fully background-checked and insured cleaners for a flat rate of £10 an hour. 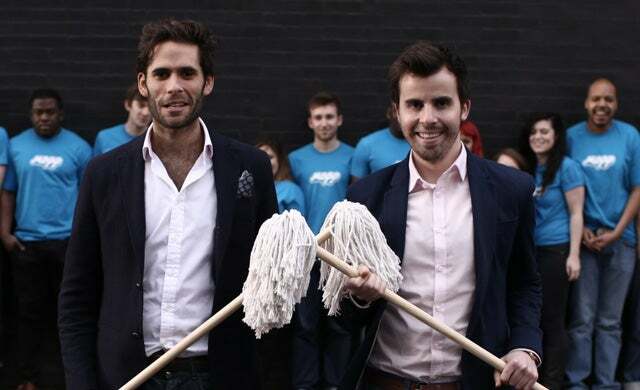 Mopp is changing the way the cleaning industry works. We’re disrupting a dated industry by bringing the process online, making it easy for the customer to book a cleaner they can trust, and helping local independent cleaners find more work, that is better paid and that fits around their personal lives. Yes, Mopp is backed by a European venture capitalist, and is currently raising a Series A round. Before we started Mopp, both of us worked in the City: Dowds as an M&A lawyer for DLA Piper and Brooks as a commodities trader with Marubeni. We had always had a strong entrepreneurial streak however, starting several business ventures together before founding Mopp. We started a crowd-funding platform for college funds in the US (which was a finalist for DreamIt Ventures accelerator scheme), and another company importing Japanese beer, but Mopp was the one we realised that was really going to fly. We’re based in East London, so it’s a great area for meeting other entrepreneurs and start-ups. Being in this part of town also helps attract new, enthusiastic talent to join the team. We’re a young, dynamic company always on the look out to hire great people with energy and creative ideas and we’re fostering an environment to encourage this. We’re about to move to a new 3,000 square foot office near Broadway Market so we’ve got the space to stimulate creativity and grow the team in a great environment.